Set sail and learn the ABCs with a boat for each letter! Discover twenty-six types of vessels, from the more common--canoe and motorboat--to the unusual--umiak and Q-boat. Just like in Alphabet Trucks and Alphabet Trains, colorful art includes the letters of the alphabet hidden (and not-so-hidden) in supporting roles in the illustrations. The text features familiar as well as unusual boats from around the world, packing in tons of instant kid appeal, and upper and lowercase letters are integrated into the action of the art rather than solely in the typography. Back matter includes age-appropriate facts about each featured boat. Samantha R. Vamos is the author of Alphabet Boats, Alphabet Trains, Alphabet Trucks (illustrated by Ryan O’Rourke), The Cazuela That the Farm Maiden Stirred (illustrated by Rafael López) – 2012 Pura Belpré Illustration Honor – its companion book, The Piñata That The Farm Maiden Hung (illustrated by Sebastià Serra), and Before You Were Here, Mi Amor (2009, illustrated by Santiago Cohen). Samantha previously worked as an attorney, practicing in Washington, D.C. and Chicago, IL. Samantha was born in the Midwest, grew up on the east coast, and lived in the Pacific Northwest before moving to the Bay Area with her husband, son, and their rescue puppy, Bowie. Visit Samantha online at www.samanthavamos.com. Ahoy! "Raise the anchor. / Grab the oars. / Chart a course / to distant shores. "The opening rhyme sets the scene for this alphabetic litany of boats. Who knew there were so many types? Each letter/type occupies a single page and is accompanied by a simple, one- or two-sentence definition. Some are obvious choices: C for catamaran; K for kayak; T for tugboat. Others are more obscure, at least to outsiders to sailing culture: Q for Q-boat, an armed merchant ship; X for X boat, a small dinghy used to teach beginners. A few are real things but may seem forced to those not in the know: N for narrow boat; V for very slender vessel. Most are presented in a clear context, and for those that are not (U for umiak, "used for migration and trade"; Z for zebec, "a merchant ship light and fast"), readers may consult the closing glossary for a bit more information. The computer art is attractive, adding whimsy by incorporating the letters into each picture. For instance, the illustration of the dory shows people fishing and reeling in D's instead of fish, and the submarine browses the depths surrounded by fish and S's. 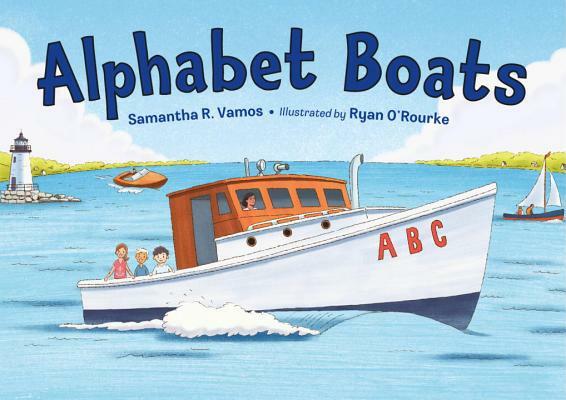 This companion to Alphabet Trains (2015) and Alphabet Trucks (2013) offers opportunities for classroom use as well as learning for boat enthusiasts.